Over the course of four decades, Margaret Gibson has amassed a body of work as rich and varied as it is consistent in aspiration. One reads a poem by Margaret Gibson and comes away having shared in the yearning to see deeply, often exploring how seeing through another’s eyes can expand our sense of self. In works such as Earth Elegy (1997), One Body (2008), and Second Nature (2010), Gibson investigates our connections with the natural world, extending the natural into all that we are and have ourselves created. The Vigil (a finalist for the National Book Award in 1993) and her memoir, Prodigal Daughter (2008), both examine the familial karma of generations. Broken Cup (2014) documents the experience of Alzheimer’s as she cared for her husband, the poet David McKain. 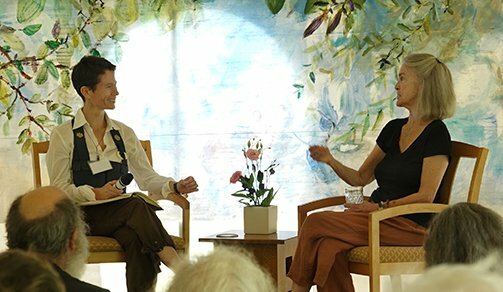 Zuisei Goddard and Margaret Gibson in conversation at the Buddhist Poetry Festival, July 6, 2018. Her latest book of poems, Not Hearing the Wood Thrush, will be out in September. 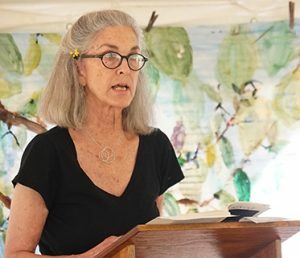 To hear Margaret Gibson’s full reading from the Buddhist Poetry Festival, introduced by Zuisei Sensei, click below. Our registrar would be happy to assist. ZMM, ZCNYC, or our affiliates.